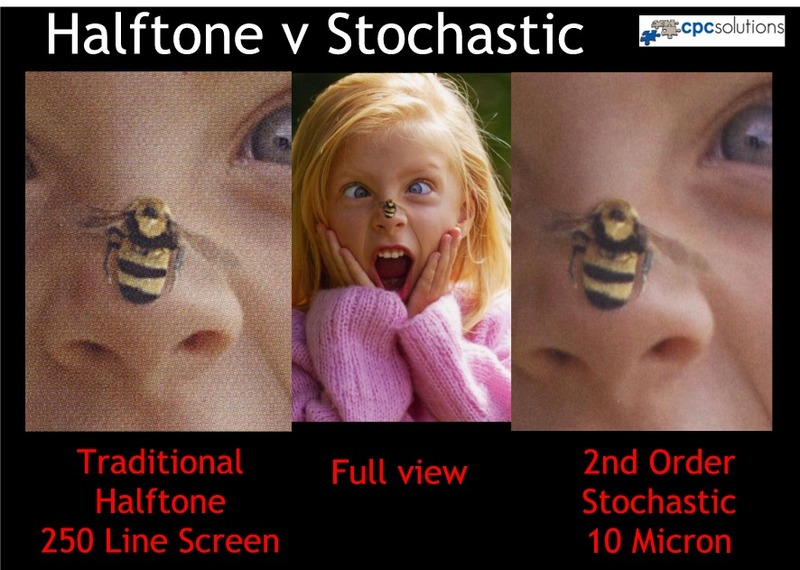 Stochastic 10 Micron, 2nd Order is a radical improvement over standard line screen. These are UNTOUCHED (scanned) versions of the comparisons…I thought you would like to see the results! The center image is the actual size as scanned from a 7 x 5 original card printed via Stochastic. This card was printed on Kromekote C12 (10 Pt) with a high gloss aqueous flood. The difference between the two types of printing relies on the technology of how the plates are processed and, subsequently, how the ink is transferred to the sheet on press. 7) An ADDITIONAL 10% – 15% reduction in ink usage (over our savings at 250 Line Screen (halftone). Please call me for details! This entry was posted in General Info, Production and Tech Info and tagged Stochastic. Bookmark the permalink.